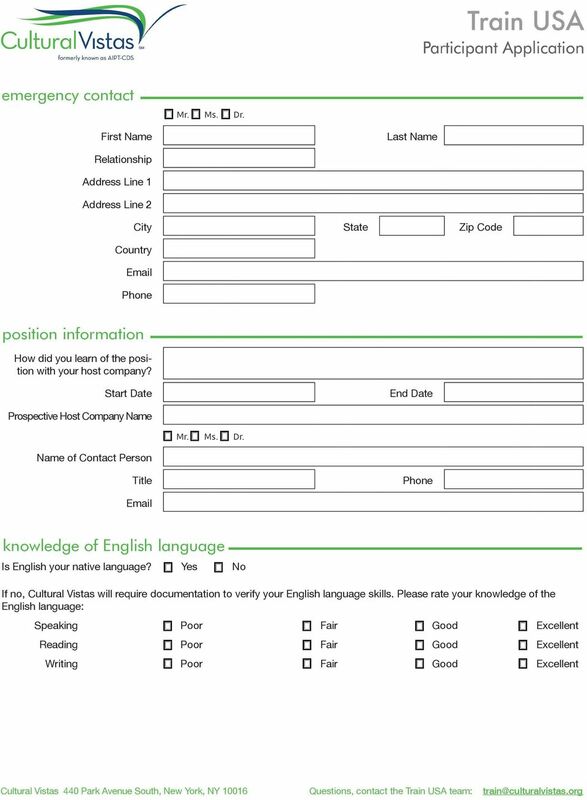 Download "Place this completed checklist on top of the application you send to Cultural Vistas." 7 essay Please respond in complete sentences and in English. Each response should be 250 words or less. (If you have participated in a J-1 visa internship or training previously please explain what new skills or knowledge you expect to gain from the experience that differs from your previous internship or training.) What specific skills do you hope to learn in the United States that you would not learn in your home country or another foreign country? How will this program benefit you in terms of career development and international cultural understanding? 10 dependent health insurance U.S. Federal Regulations state that all accompanying dependents that enter the United States under the sponsorship of Cultural Vistas must be covered by health and accident insurance for the entire duration of the training program. 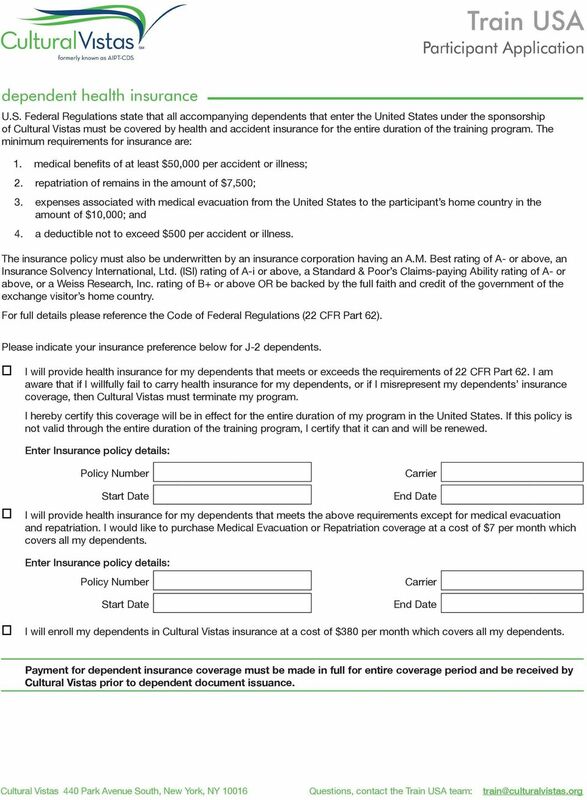 The minimum requirements for insurance are: 1. medical benefits of at least $50,000 per accident or illness; 2. repatriation of remains in the amount of $7,500; 3. expenses associated with medical evacuation from the United States to the participant s home country in the amount of $10,000; and 4. a deductible not to exceed $500 per accident or illness. The insurance policy must also be underwritten by an insurance corporation having an A.M. Best rating of A- or above, an Insurance Solvency International, Ltd. (ISI) rating of A-i or above, a Standard & Poor s Claims-paying Ability rating of A- or above, or a Weiss Research, Inc. rating of B+ or above OR be backed by the full faith and credit of the government of the exchange visitor s home country. For full details please reference the Code of Federal Regulations (22 CFR Part 62). Please indicate your insurance preference below for J-2 dependents. I will provide health insurance for my dependents that meets or exceeds the requirements of 22 CFR Part 62. I am aware that if I willfully fail to carry health insurance for my dependents, or if I misrepresent my dependents insurance coverage, then Cultural Vistas must terminate my program. I hereby certify this coverage will be in effect for the entire duration of my program in the United States. If this policy is not valid through the entire duration of the training program, I certify that it can and will be renewed. Enter Insurance policy details: Policy Number Carrier Start Date I will provide health insurance for my dependents that meets the above requirements except for medical evacuation and repatriation. I would like to purchase Medical Evacuation or Repatriation coverage at a cost of $7 per month which covers all my dependents. Enter Insurance policy details: Policy Number Start Date Carrier I will enroll my dependents in Cultural Vistas insurance at a cost of $380 per month which covers all my dependents. Payment for dependent insurance coverage must be made in full for entire coverage period and be received by Cultural Vistas prior to dependent document issuance. 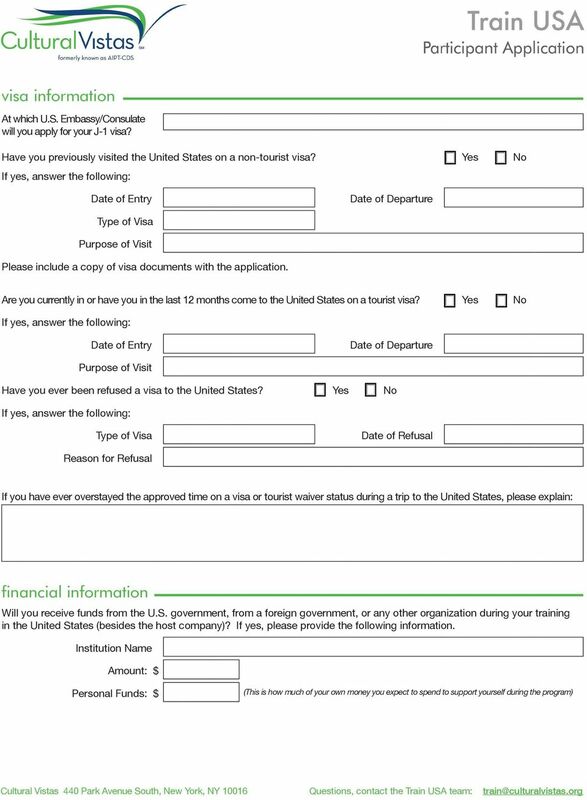 11 Exchange Visitor Obligations and Responsibilities I recognize that Cultural Vistas is my legal sponsor while I am in the United States as a J-1 participant. I acknowledge that Cultural Vistas must approve in advance any changes in the program and that I am responsible for reporting to Cultural Vistas, in a timely manner, any changes in program location; dates; salary; or any substantial changes in the content of my program. I understand that I am not authorized to leave my Cultural Vistas-sponsored training/internship program, nor will I seek a training/internship position with any other U.S. company/firm/organization while I am sponsored by Cultural Vistas. In the event of a breach in the internship program on the part of the host organization, I will contact Cultural Vistas immediately to seek assistance. If I voluntarily leave my host company, I agree to leave the United States within 10 days and will provide a copy of my airline ticket out of the United States, and an explanation of my departure. I understand that if I leave my training/internship program and do not leave the US by the date agreed upon with Cultural Vistas my program will be cancelled and I will be in the United States illegally. If I change host organizations without permission from Cultural Vistas, my program will be terminated and I will be required to leave the United States. I understand that the intent of the J-1 Exchange Visitor Visa program is to allow me to enhance my skills and gain exposure to U.S. culture and business practices that will be beneficial upon my return home. Use of the program for ordinary employment or work purposes is strictly prohibited. I hereby pledge that I will not seek any changes in visa status during my Cultural Vistas-sponsored J-1 visa program. Therefore, it is my intention to leave the United States at the end of my program. 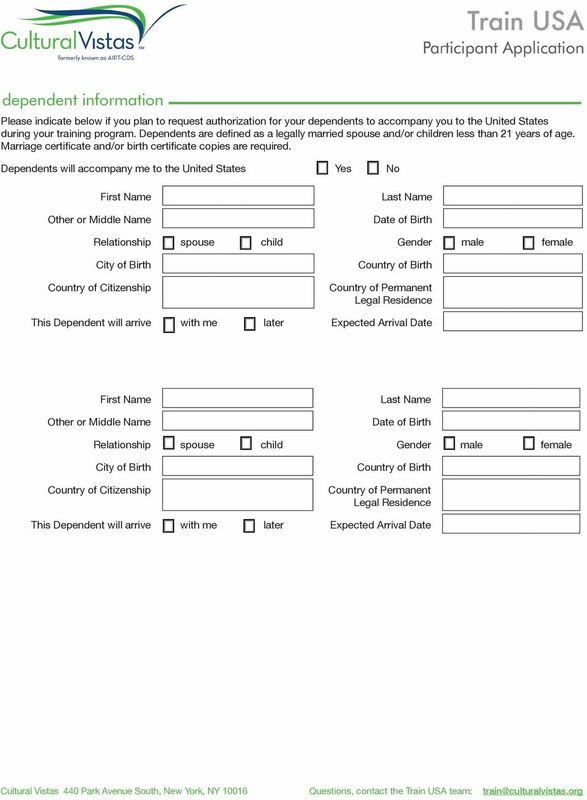 I agree to provide Cultural Vistas with my date of entry to the United States, an established local U.S. address and phone number within 10 days of arrival, as well as all Cultural Vistas forms and evaluations. During my stay in the United States, I will notify Cultural Vistas of any changes in my current address within 10 days of the change. U.S. government regulations stipulate that failure to do so will result in the automatic cancellation of my J-1 visa. I understand that my Certificate of Eligibility (Form DS-2019) will reflect the dates of my training/internship program. 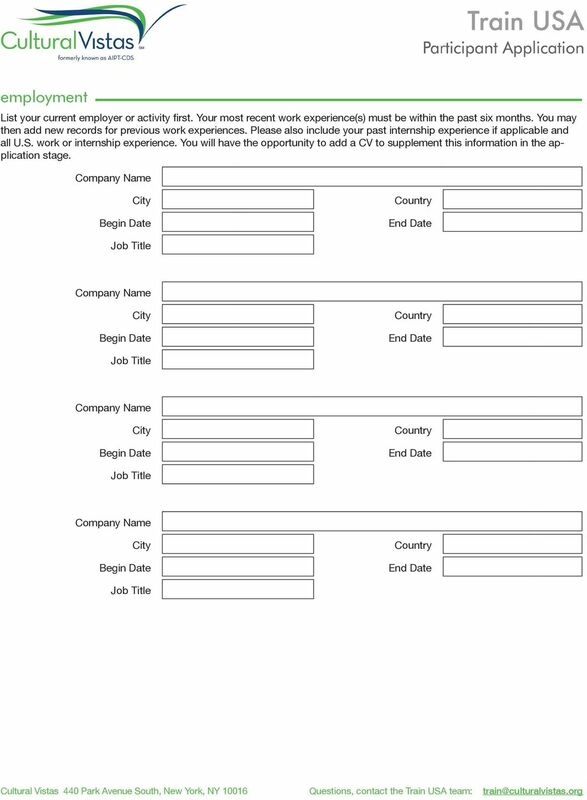 I realize that if I complete my program I will have 30 days beyond the end date given on the Certificate of Eligibility to conclude my affairs and travel in the United States, and that I will then be expected to exit the United States. I certify that I will comply with laws, regulations and/or instructions of appropriate government agencies in the United States. Failure to do so may result in cancellation of my program by Cultural Vistas. I understand the U.S. consulate or embassy will make the final determination whether to issue the J-1 Exchange Visitor visa. Cultural Vistas has no power to influence either a positive or negative decision on my behalf. Cultural Vistas reserves the right to withdraw sponsorship at any time. I understand that although my Cultural Vistas health insurance plan is compliant with the Department of State regulations, it is not intended to provide comprehensive health care coverage and does not meet Minimum Creditable Coverage standards required by state law in Massachusetts. I agree that I am responsible for any penalties incurred as a result of my non-compliance with the Massachusetts state standards. For more information call the Connector at MA-ENROLL or visit the Connector website ( If you have questions about this, you may contact the Division of Insurance by calling (617) or visiting its website at I take part in a training/internship program in the United States at my own risk and of my own volition. Cultural Vistas cannot be held liable under American or my home country s law for any damage or injury; in particular injury to persons or damage to property, suffered by or caused by myself, during the course of the program. Application for Trainee Programs To be completed by individual applicant. 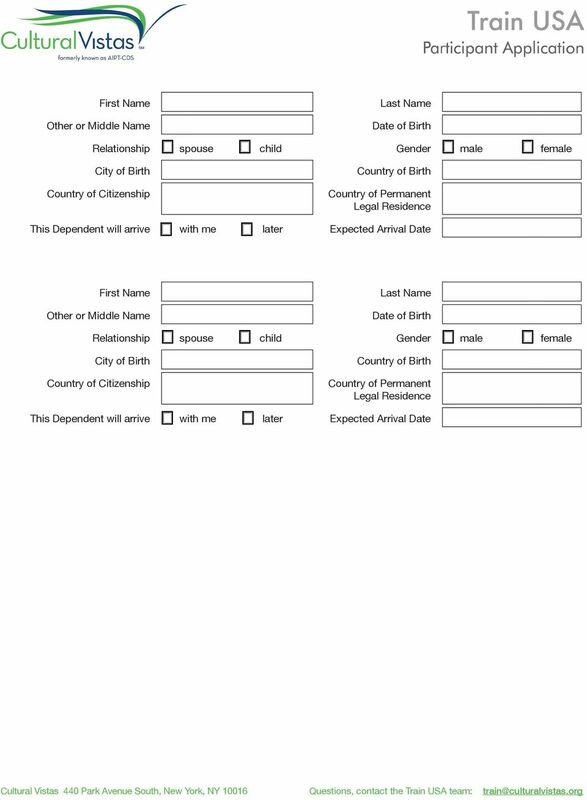 Exchange Student Application Packet Part II: Please note: Visa and Finances Insurance Immunization The documents in Part II of the Exchange Student Application Packet may NOT be submitted electronically. Thank you for your interest in becoming an Intern/Trainee through the Council on International Educational Exchange (CIEE). INTERNATIONAL STUDENT S PASSPORT TO ESSEX COUNTY COLLEGE! EARLY COLLEGE ADMISSIONS APPLICATION. You can get anywhere from here. 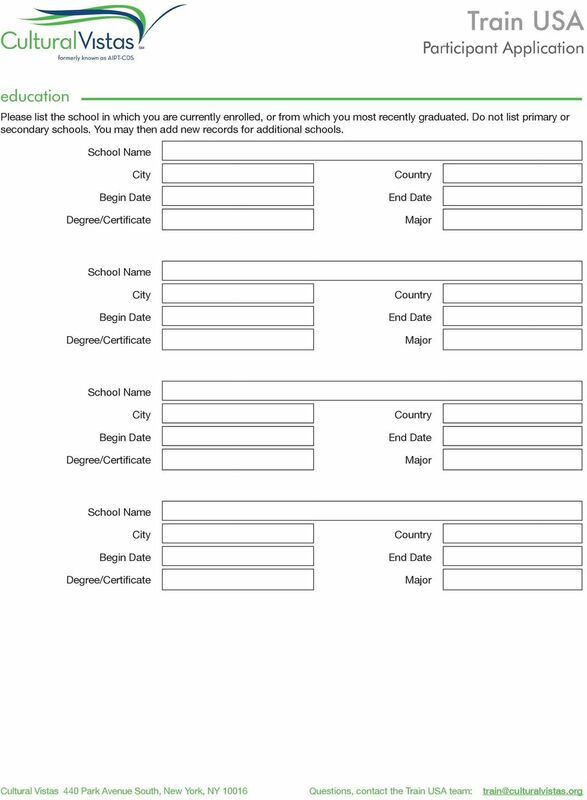 EARLY COLLEGE ADMISSIONS APPLICATION SM You can get anywhere from here. Please print or type: EARLY COLLEGE APPLICATION Last Name First Name Maiden/Middle Social Security # Local Address (include apt. Rider University College of Business Administration 2016 Travel Courses We will accept applications on a rolling basis until the courses are closed. We will begin reviewing applications on April 20, 2015. 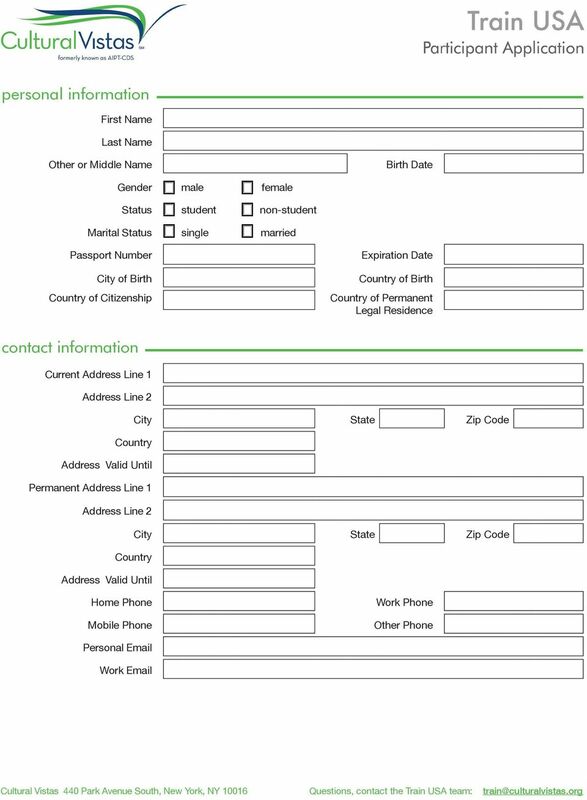 Canadian Application for Form I-20 and Certification of Financial Responsibility IMPORTANT: The information on the following pages explains how to become eligible for F-1 student status in the United States.